According to their website, Carrion Films aims to celebrate "the neglected aspects of British folklore and British gothic." 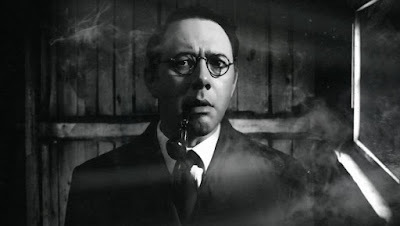 Their newest film four years in the making, Borley Rectory, certainly does just that, but additionally seems to celebrate a unique cinematic style that emulates and pays homage to horror films of the silent era. Borley Rectory examines the strange and varied history of the long destroyed house of the same name in Essex, in particular the infamous hauntings that happened there in the late 1920s. The building was called the "Mount Everest of haunted houses" and there are records of over 2000 paranormal occurrences. Borley Rectory became well known in the popular press due to the writings of famed paranormal investigator Harry Price, who wrote two books on the topic and was writing a third when he died. What truly sets the film apart from other recountings of supernatural activities is its extraordinarily unusual style. It's a little hard to describe, but essentially it aims to look and feel like a silent film, with a hefty dose of careful and creepy animation blended in. It seems like many of the sets are just genuine photos of the house, with the actors placed inside. The animated rain, fog, and ghostly activity work very well with the shaky black and white film look, and all of it works together to create a cinematic experience unlike anything I've seen before. Fans of the recent Conjuring series will find lots to love here as the film explores the fascinating story of real life paranormal investigation, and how the true family dramas surrounding the supposed ghosts are sometimes even stranger than the ghosts themselves. Price's strategies and methods are entertainingly portrayed, and what he and his cohorts experience is creepy and fantastically visually represented. More than that though, I found myself really enjoying the film as a huge fan of the equally bizarre 1922 documentary Häxan. Borley Rectory seems to draw from Häxan's unique blend of documentary recreation and weird supernatural embellishments. The look of the ghosts as they blend in and out of the foggy exteriors and flapping window curtains perfectly captures the odd sense of what experiencing something like this in real life must feel like, and there's a tension in the exploration of the mystery that would've been hard to fake. Borley Rectory seems like it could have been an intensely labored over short film; instead, we get this astonishingly unique feature film that defies categorization. It does something that is rarely accomplished: to tell a fascinating story in an equally fascinating way, and is worth seeking out for anyone interested in an important piece of paranormal history and a fun movie experience! Borley Rectory is directed by Ashley Thorpe and is showing on Saturday, 11/18 at 8pm at the 7 Stages Theater in Atlanta, Georgia as part of the 2017 Buried Alive Film Festival. 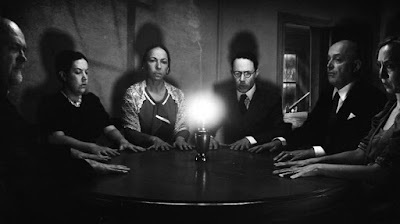 Learn more about Borley Rectory at it's official website.